Traveling with a toddler or child in the car is something important nowadays for every parent. In cases like these, a car seat is the most important tool that ensures their safety. Known as child-restraint seats, infant safety seats, baby seats or simply car seats, this piece of baby gear is required from your the birth of your child until they are 7-8 years of age (depending on the model you are buying). Basically, the main aim of the car seat is to protect your loved one from injury or even death in the case of a car accident. There are even some statistics showing that car seats are crucial for the safety of your child. What’s also important to know is that car seats are the main factor for child safety on the road – according to many organizations around the world. Lightweight car seats are thereby very important. They are easy to carry, easy to install and easy to remove. For many parents, they are the best option for a struggle-free experience – whether it’s a trip to the local supermarket or the open road. 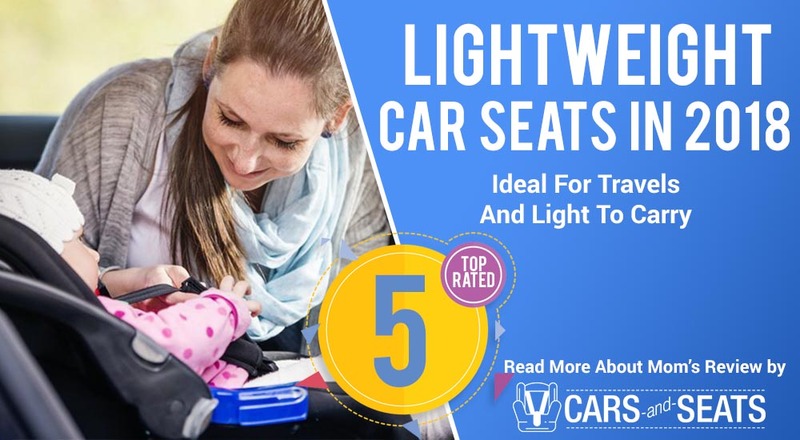 In order to help you choose the best lightweight baby car seat on the market, we are listing the top-rated products below. If you are looking for a lightweight seat that is perfect for the first drive home, this is one of the best infant car seats on the market. 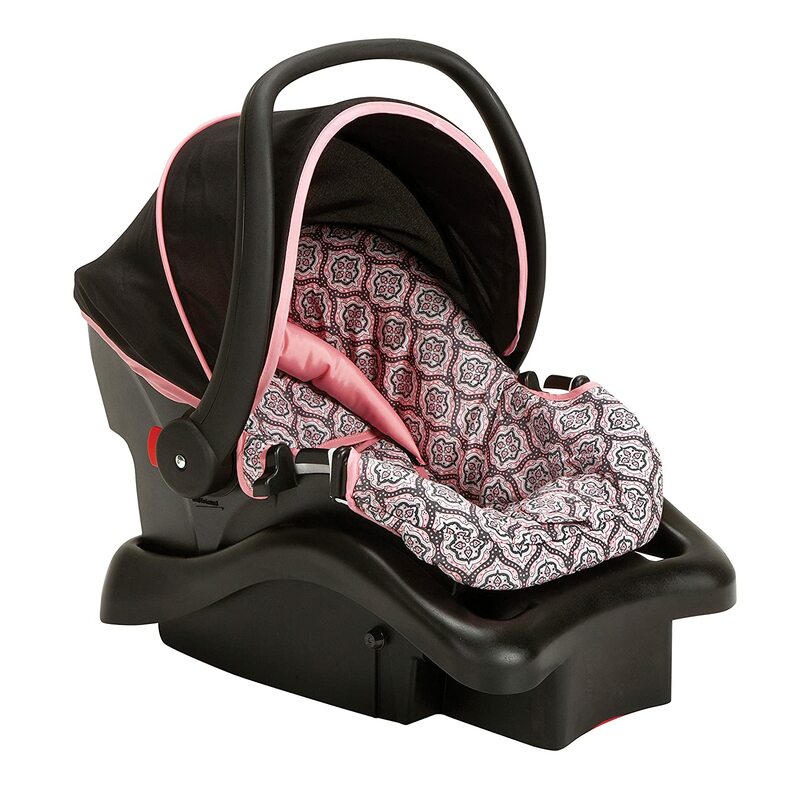 Carefully designed to keep your little ones safe, it is designed for both newborn babies and toddlers up to 22 pounds in the rear-facing position. What’s most important with Safety 1st’s products is that it is engineered to keep your baby safe with a lot of safety in mind – including side impact protection. There is an easy to adjust safety harness and a technology for easy buckling and unbuckling. The item weighs only 11 pounds which is the most important factor in this review. Every retail car seat must pass certain federal safety requirements – and there are absolutely no safety ratings to distinguish one above the other. That said, you can purchase this affordable baby car seat with maximum confidence that it passes the rigorous safety tests. 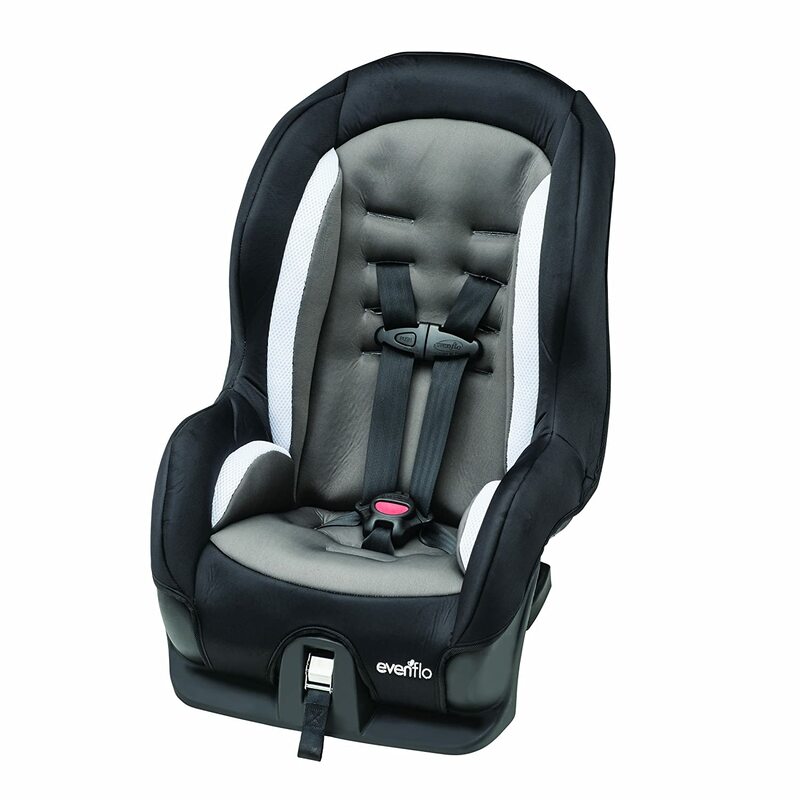 The Light ‘n Comfy Elite is rated to support children between 4 and 22 pounds. Since most premature babies are born below 5 pounds, this is a great option for preemies. However, another downside is that the average child will outgrow this seat within the first year (or year and a half) of life which means that you have to buy a new rear or forward facing car seat. The base of this seat feels flimsy in comparison to other car seats – but it is easy to install and use it. The carrier is compatible with any stroller. Also, the cushions are not machine washable which means that you will have to clean the seat by hand. In summary, the Safety 1st Light ‘n Comfy Elite is an affordable and lightweight car seat that gives you all the features you need. It can be a great secondary car seat – however you have to spend a little more to get something with more features if you want the product to act your primary infant car seat. According to the official site, Evenflo recommends that your child is at least one year of age in order to start using the Tribute Sport lightweight and convertible car seat. However, one year olds nowadays come in different weights and heights. 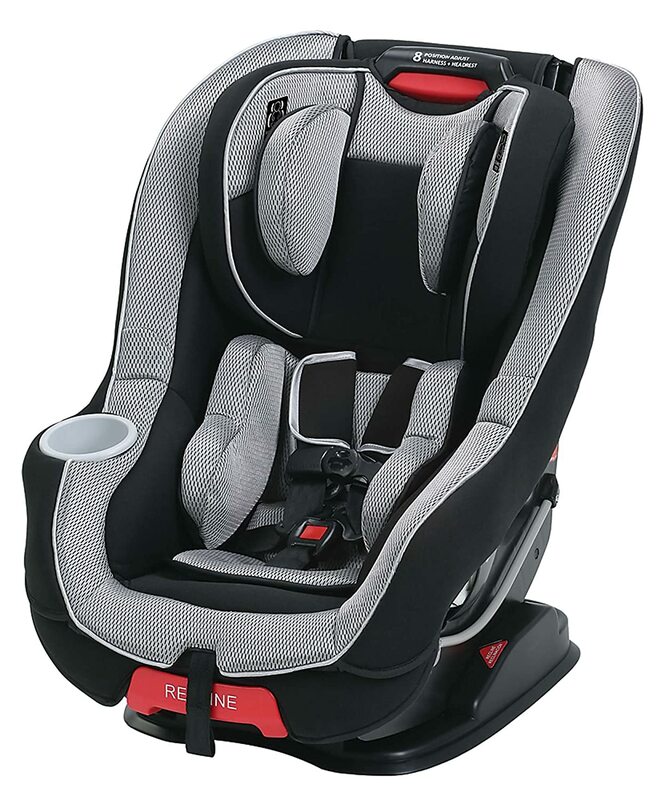 The best way to ensure that your child is fit for this seat is to make sure that they are at least 19 inches tall when using the seat – which is the minimum height you can put your child onto the seat rear-facing until they reach the maximum height of 40 inches before they transition to the forward-facing mode. If you are wondering whether this car seat easily fits your car, the best way to ensure that is to look at its proportions. Its width is 18.5 inches, the height is 25.5 inches and the depth (length) is 22 inches – so make sure to consider that when measuring your car. One thing that parents found common is that the edges of the base have a tendency to dig into the car seat – which is why you may want to consider getting a seat protector. The rear-facing mode installation of this seat needs you to use pool noodles or rolled towels. In case you decide to use the LATCH system, it would be good to leave the car seat permanently in the car – and makes it extremely difficult to remove the seat. A good thing is that your child will stay safe in the event of an accident all thanks to this technology. 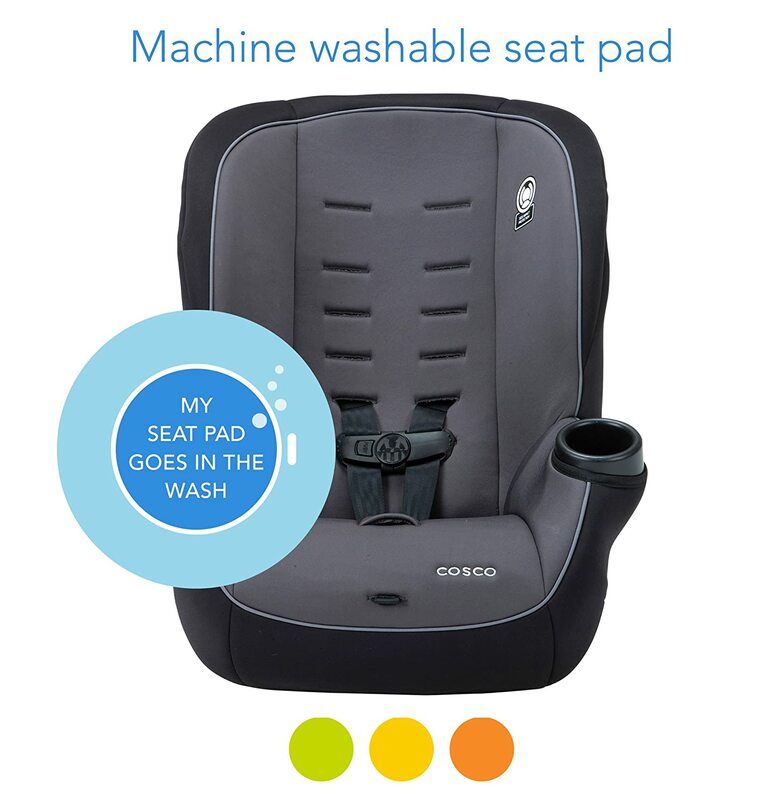 The actual seat comes with a thin and wipeable fabric which means that if you need to remove the car seat cover for washing, it would be easy to do that. Since the padding is quite thin, this car seat may not be comfortable for long rides. If you are in search for a booster car seat that won’t struggle you when taking it up and down the stairs, between cars or during long travels, this is one of the car seats you should consider. Basically, the Cosco Finale DC 2-in-1 booster car seat is a hybrid of a booster and a convertible car seat. The slender design is awesome and compared to some of the other lightweight car seats, it is something that makes a big difference. Some of the key points include the fact that this product is versatile, lightweight, easy to install and adjust the seat belt. As for the cons, the cup holder doesn’t stay on well and it may be a little too roomy for a small toddler. 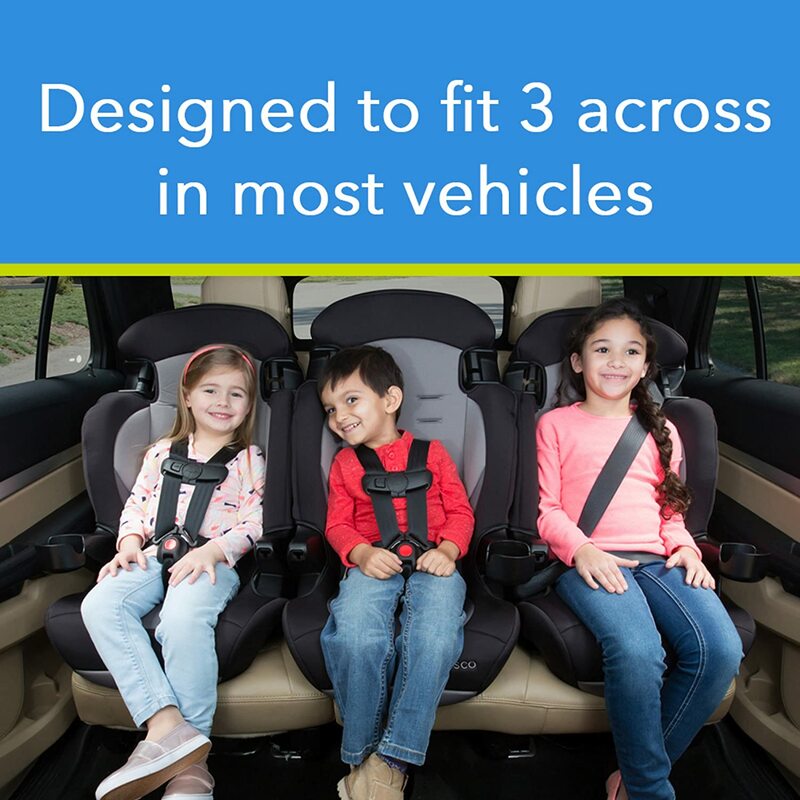 However, the extended use of this product and its 2-in-1 features allow forward-facing with harness (for kids of 30-65 pounds) and forward-facing with a belt-positioning booster (for kids of 40-100 pounds). The straps can be easily adjusted from the front tether and the harness system also has 2 height positions. The main factor that makes this seat desirable by parents is the lightweight aspect – which is obviously its unique selling point. Some parents say that this lightweight car seat has no recline position for sleeping – but after all it is a booster car seat meant for short travels and not long road trips. For vacation trips, this lightweight car seat is comfortable and easy to use, remove or install for the occasional trips during your vacation. The Cosco Finale is one of the recommended lightweight seats online. 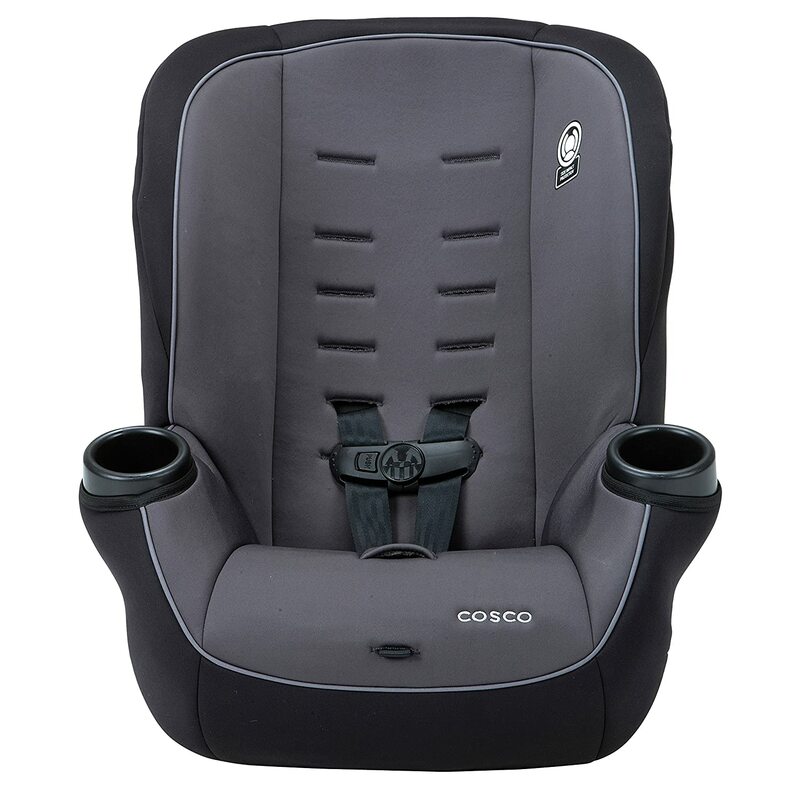 The Cosco Apt 50 is a car seat which can be used rear facing for kids of up to 40 pounds – and an extended use in the forward facing mode for kids up to 50 pounds. Some of the best features are the lightweight design – the item only weighs 11 pounds – as well as the range of features and extras such as easy cleaning, best fit and snack time. This model is also certified for airplane use. The ‘Ready To Fly’ label in the Apt 50 gives your child a comfortable seating option during a flight and the compact design can also get you through the airport without weighing you down. This combination of features is why more and more parents are purchasing the Cosco Apt 50 and getting the most of its features. When it comes to extras, there are two cup holders perfect for drinks or snacks and giving a lot of options during the ride. Additionally, you shouldn’t have to worry about dropped juice or cracker crumbs as the pad is easy to remove and wash. All you need is to toss it into the machine and get a nice clean without any struggle. As a lot of users say, this is one of the best convertible car seats under $250 and definitely among the leader when it comes to lightweight car seats. Easy to install, take out and release the latch strap, it is a seat that is perfect for traveling. The color options are also amazing as there are pink, blue and camo designs – ideal for both boys and girls and looking amazing. The seat is slightly wider than average and the height limit tops out at the average 5 year old. This makes it a basic car seat without all the bells and whistles which – and finally one of the best lightweight car seats on the market. With a weight of less than 20 pounds, this is one of the best lightweight convertible car seats on the market. 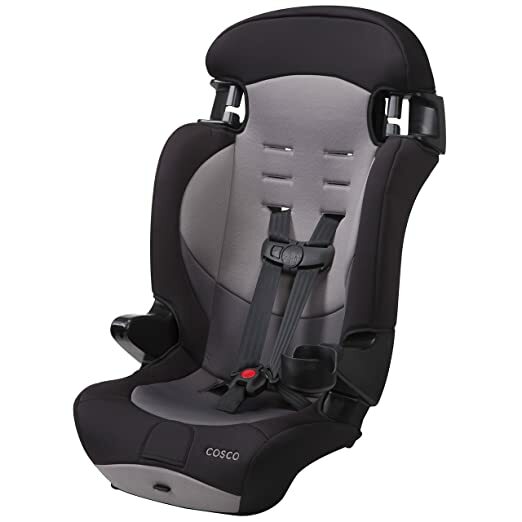 Graco, on the other hand, is a reputable manufacturer of quality car seats that pass a lot of tests and exceed the safety standards. Since it is convertible, the Graco Size4Me lightweight car seat can be used for rear-facing infants from 4 to 40 pounds as well as forward facing toddlers from 20 to 65 pounds. There is a Simply Safe Adjust Harness System which excels when it comes to safety – and a set of side impact pads that are tested for occupant retention with the built-in 5 point harness system. As one of the best convertible car seats that allows children to enjoy the premium features, this lightweight baby seat is also affordable having in mind the features that it comes with – and the lifespan of use you should expect from it. There are two more reasons why the Graco Size4Me convertible car seat is great for small babies. One of them is the infant insert that helps provide added support around the baby’s vulnerable parts and boosts them up so they are seated safely and securely. The other are the bottom harness slot heights which are low enough to enable you get a snug fit around the shoulder areas of the baby. This lightweight car seat also comes with a premium harness adjustment system that you can expect to find only on much more expensive seats. The Simple Safe Adjust Harness system will allow you to increase the height of the headrest and the shoulder harness straps without having to rethread the harness or make other changes to the configuration of your seat. In the end, lightweight car seats are great for use in cars, planes and vacations. They mimic the best features of the bulky car seats (which are heavy to carry around) and replicate the same technology. They are also amazing when used in compact vehicles and small cars – and don’t struggle you when carrying them up and down the stairs or when single-handed. We really hope that this review helped you find a lightweight car seat for your needs at an affordable price. All of the above mentioned products are designed by reputable brands and can be purchased online!